The Lifelong Fitness Alliance is a non-profit organization encouraging individuals to embrace the benefits of physical fitness. Based in northern California, the organization is reaching out across the U.S. through athletic events and programs that anyone can initiate in their community. LoveToKnow Seniors talked with Executive Director Patricia O'Brien about the success of the organization, the Stepping Strong program, and how others can get involved. How did the Lifelong Fitness Alliance start? 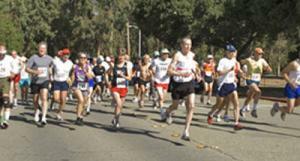 Originally, the organization began as a runner's club, but our mission has always been to promote the joys and benefits of physical activity and to provide information and opportunities for activity. Throughout the years, in an effort to reach those people who may not necessarily resonate with running, we embraced a wider range of activities, including biking, kayaking, swimming, and walking. Can you share some stories of how members of the Alliance benefit from participation? The transformation of a sedentary person who becomes more active is truly a thing of joy. In the fall of 2007, under the capable hands of Lifelong Fitness Ambassador, Norm Thomas, we implemented a walking program at Monte Vista Grove, a senior residence in Pasadena, California. One of the participants, a 74-year-old woman, was in so much pain and discomfort that she used a scooter for mobility. She reluctantly began the walking program, and at the end of 10 weeks, she was walking, pain-free, 10,000 steps on her own. She reported increased energy and self-confidence, as well as weight loss. Another of our pilot program participants, a 70-year-old man, was barely able to walk 10 steps when he first joined the 10-week walking program. Along with that, he was taking blood pressure medicine for high blood pressure and insulin for diabetes. And he was substantially overweight. At the end of the 10-week program, he was able to walk for miles, discontinue his blood pressure medicine, decreased his insulin, lost 40 pounds, and took up dancing! He continues to wear his pedometer, often announcing with pride the number of steps he has taken during the day. Research has shown that regular physical activity has a positive impact of reducing the chance of getting cancer, diabetes, heart disease and stroke. Exercise strengthens bones and muscles, improves balance (protecting against falls), improves mental health and mood, and increases your chance of living longer. Our personal experiences with individuals who embark on a physical activity program is that it can make positive changes in a variety of ways. 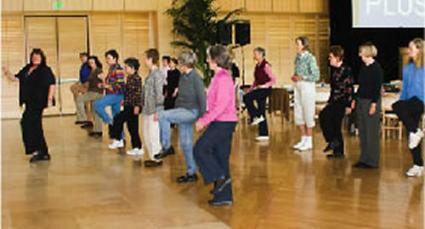 One aspect of the Lifelong Fitness Alliance that everyone can join is the Stepping Strong Program. Please tell us about it. Our Stepping Strong program is a pedometer-based, Ambassador-led, walking and wellness program that has been designed to provide support and opportunity for participants to "step up" their physical activity, while gaining knowledge through weekly wellness meetings that include an educational element and a walk. Then the group walks together. Participants track their steps with a variety of tracking tools, reporting in each week, and we always hope to see an improvement throughout the weeks. Much research has been done on the use of the pedometer in increasing physical activity, and this, along with the encouragement of the Ambassador and the support materials, has shown us very positive results. We have offered the program in community settings, such as senior centers and residences, community centers, city government centers, parks and recreation departments, as well as to employee and faith-based groups. Each participants starts from where he or she is, and we try to make it fun, rather than fiercely competitive. You've mentioned the term "ambassador" a few times. What is this role? The Ambassador is a key element to the program. Lifelong Fitness Alliance recruits and trains Ambassadors, who are peer-group community members, who are provided with a curriculum, information and support by our organization, and who is in charge of leading the groups throughout the weeks of the program. In the Stepping Strong Program, the Ambassador is provided with all the materials needed to lead the group, and we are available by phone for counsel and support. We provide a training manual and video training, an online area for dialog and quarterly phone or in-person meetings, depending upon the location of the group. We also have Ambassadors who lead hikes, bike rides and other sort of activities. This is a less structured, but no less valuable role that our volunteers play in the organization. "Live Long and Die Short"
What does the Lifelong Fitness Alliance hope to achieve in the future? I am privileged to work with a very passionate and dedicated board of directors, and I think that I can speak on behalf of all of them when I say that our hopes for the future would be to optimize health and to minimize escalating medical costs through a nation and onward - a world which understands the benefits of physical activity and puts that understanding into practice. We just want to get everyone moving! Noted gerontologist Dr. Walter Bortz, a member of our board, likes to say, "It's never too late to start, and it's always too late to stop." Our goal at Lifelong Fitness Alliance is to ensure that individuals "live long and die short." During your involvement with the program, what has surprised you?During the summer of 2008, I acted as Ambassador in several community and senior centers to get a feel of the position. I felt secure that I was going to share my knowledge and my experience and that participants would learn a lot and be healthier. My greatest surprise and pleasure was how much I learned from them - their health experiences, their life stories, the unique friendships I forged and that I continue to maintain. Walking together or participating in a physical activity with a group is a wonderful way to build camaraderie, to break down barriers and to develop wonderful and long-lasting friendships, while doing something really wonderful for both your body and your mind. I am also continually surprised by the health and vitality of so many of the participants in our fitness weekend at Stanford University. Dr. Bortz, who I mentioned previously, is 78 and runs a marathon every year. Another member, Joy Johnson, just won the NYC marathon in her age group. She is 81. The first year I worked here, I was fortunate to be able to give away the awards for our race. 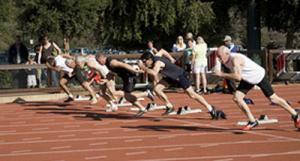 I was absolutely stunned at the amazing physical shape of the participants between the ages of 60 and 80. I am constantly surprised by the vitality of our members and our participants. I'm inspired daily! Visit the Lifelong Fitness Alliance website to learn about the organizations various activities. Learn more about the Stepping Strong program. Review the guidelines for becoming a Fitness Ambassador in your community.